A relative of parsnips, carrots offer great phytonutrient antioxidant benefits including carotenoids, hydroxycinnamic acids, and anthocyanindins. 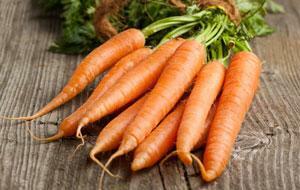 Orange carrots, the most popular, offer a rich source of beta carotene. In the body, beta carotene is stored in the liver, and from there the body converts it into vitamin A. And beta carotene may help increase memory and protect your cells from free radical damage. In one carrot intake study, deep orange foods seemed to be the most protective against cardiovascular disease (CVD). And another health benefit associated with carrot intake is eye health, particularly lower rates of glaucoma. A deficiency in vitamin A can lead to poor vision, and including carrots into your diet is a great way to add vitamin A back into the body. Carrots are not just for snacking, and they can be boiled, fried, roasted and steamed! Slice or grate carrots and add to salads; add carrots to soups, stews and slow-cooker recipes; make a flavorful carrot soup with your favorite spices; pickle carrots; add carrots to vegetable platters; blend carrots with fruit juice, yogurt and honey for a super nutritional smoothie; dip carrots into peanut butter for a tasty snack; or cook up a scrumptious side dish by sautéing carrots in butter, sugar and balsamic vinegar.